Luis Mayancela, who is now 18, fell off a roof and broke his leg while doing construction work in Portland, Maine, at age 15. His employer did not call an ambulance. Instead, a co-worker drove the Brockton High School freshman 75 miles in an old work van, across state lines, to a hospital in Massachusetts. As they crawled through rush-hour traffic, Mayancela had no idea his boss would try to dodge responsibility for the accident. A Globe investigation found that these workers, eager for a paycheck, are often paid below the prevailing wage and illegally, in cash. They are also the most likely to be subjected to unsafe work conditions, without insurance to cover medical bills or lost pay if they get hurt. And the unscrupulous contractors who employ them are too seldom caught and penalized. Federal officials identified 910 “willful or repeat violations” that involved hospitalizations or deaths in the Massachusetts construction industry over the past three years, according to public records requested from the US Labor Department’s Occupational Safety and Health Administration. Of those, 98 percent took place on jobs run by nonunion contractors, OSHA said. The real number of injuries is likely higher, advocates and government officials said, because undocumented workers on these job sites often are pressured not to report accidents. Interviews with more than three dozen construction workers, legal advocates, and regulators, as well as construction site visits and the review of hundreds of pages of records, reveal industry practices that routinely exploit immigrant workers. They also point to companies that are repeat offenders, undercutting legitimate contractors who play by the rules. Sometimes the victims are minors, or young men barely in their 20s. ■ A 23-year-old roofer from Ecuador shattered his collarbone after falling from a 32-foot ladder in Waltham during Christmas week in 2014. His employer told him to drive himself home, even though he had been briefly knocked unconscious. It took five days for him to get medical care, and a year-and-a-half before receiving the surgery he needed to repair the break. ■ A dozen immigrant workers repeatedly sought a combined $150,000 in back wages from a New Hampshire drywaller who, they said, threatened not to pay them if they quit. When they finally made plans to leave, he left a profanity-laced voicemail on the phone of one of the workers. ■ A former Boston restaurateur-turned-contractor routinely failed to pay immigrant construction workers, even after they traveled to his home to complain and court judgments were entered against him. Plenty of US citizens and documented workers get hurt in construction, too. But undocumented immigrants, deeply woven into the fabric of the economy in ways often overlooked by the public and political candidates, face additional struggles. Isidoro Peralta fell from a 32-foot ladder while working in Waltham. His broken collarbone healed improperly, and he had to fight for medical care for a year-and-a-half before having corrective surgery at Boston Medical Center. Many do not speak English and are unfamiliar with federal and state labor laws, which require employers to pay them at least minimum wage and carry workers’ compensation. These workers are often improperly characterized as independent contractors by employers who want to avoid paying their insurance and payroll taxes. When injured, these workers can get lost in medical limbo. If they tell doctors they were hurt on a work site but have no pay stubs or documentation to prove who their employer is, it can be next to impossible to get care, according to lawyers, advocates, and regulators. 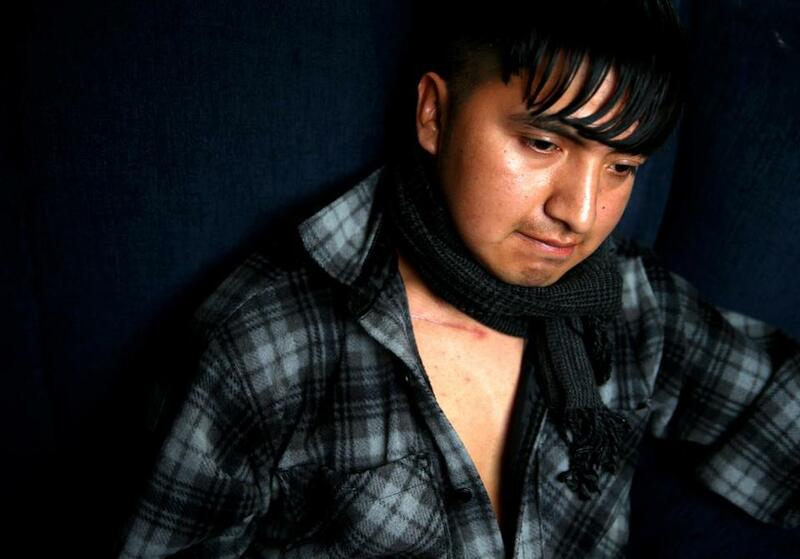 That’s what happened to a 16-year-old Guatemalan youth, nicknamed Baby, on the work sites of a Lynn contractor. He plunged to the ground last fall from a ladder while lugging too much wood for his 118-pound frame. His employer dropped him off at home that night instead of taking him to a doctor, according to the boy’s account to the Globe, his lawyer, and advocates. He was for months declined medical care because he had no legal guardian and no employer offering to pay his insurance, his lawyer said. In another case, Isidoro Peralta, the Ecuadoran roofer, had to fight for medical care for a year-and-a-half after falling from a ladder in Waltham. While he waited, his collarbone healed improperly and he could no longer lift weight with his right arm. He was out of work, without pay, and in pain. When Peralta talked to his employer at AN Construction, “Nothing happened,” he said. Indeed, his boss, Angel Namina, denied to his insurer that Peralta was hurt on the job, according to Peralta’s workers’ compensation claim filed with the state. The owner of the Milford construction outfit did not answer calls to his phone and could not be reached. He has failed to pay a fine for a prior serious violation with OSHA for failing to guard against fall hazards, according to public records. Peralta’s lawyer fought the claim denial and reached an agreement with the insurer, so Peralta could have surgery. His doctor at Boston Medical Center said he had to cut apart his clavicle and repair it. Peralta said he was warned that if the doctor missed by a quarter-inch and sliced an artery, Peralta would be at risk of dying within a minute. AT LUXURY CONDOMINIUMS in Wellesley and modern apartment complexes in Chelsea, as well as building projects for colleges and major retailers, developers have been accused of looking the other way when subcontractors underpay workers and cut corners on safety. Wage and safety violations have resulted in 1,300 complaints in the past three years just to the Massachusetts attorney general’s office. Some incidents have involved broken limbs, concussions, and wounds that went untreated for long periods because employers failed to provide the required insurance. Many workers are urged not to say that injuries occur on a work site. Some fear losing their jobs if they complain, or worse, being exposed as undocumented, then deported. Mayancela, who fell from the roof in Maine in the summer of 2013, was lucky in one way: He eventually received the care he needed, after being transported to Boston Children’s Hospital and later having a rod surgically placed in his femur. Low, the Metrowest worker advocate, helped him navigate medical appointments. A Medford lawyer who specializes in such cases, Stacie Sobosik, cut through layers of subcontractors to find an employer in the chain whose insurance would pay for his coverage. “It had nothing whatsoever to do with our company, although it dragged us through the mud for a while,’’ said King Weinstein, the Old Orchard Beach, Maine-based general contractor at the house where Mayancela fell. He said his firm ran its usual checks on the Massachusetts roofing subcontractor, Force Corp., and confirmed it had liability insurance and workers’ comp coverage at the time it was hired. But those checks did not turn up problems at Force or with its general manager, Juliano Teles Fernandes. Mayancela was receiving pay on the Portland job from Twin Pines Construction Inc., a company owned by Fernandes. He and companies he has owned or managed have been cited for more than 100 violations since 2007, by federal safety regulators, including some that endangered workers’ lives, according to public records. Over his career, Fernandes has racked up obligations and fines of $1.5 million with OSHA that have not been paid. The US attorney’s office in Boston is suing to collect those. Fernandes and his Twin Pines firm were cited by the agency in May 2013 for serious and willful violations. That June, Fernandes let his workers’ comp policy lapse, according to public records. A month later, Mayancela fell from makeshift scaffolding in Maine. Fernandes would claim to OSHA investigators that yet another subcontractor was the teen’s employer. But if there was such an assignment, it was informal and did not relieve Fernandes of his responsibility. The insurer for the other subcontractor — the same as Force’s — ultimately covered the claim. Force, which has had offices in Woburn, Clinton, and Lunenburg, was cited by OSHA in the Mayancela case for having a child under age 16 do hazardous construction work and for failing to keep proper date-of-birth records. It’s illegal in Maine to hire anyone under age 18 for roofing. Yet the fine was modest: $15,350. 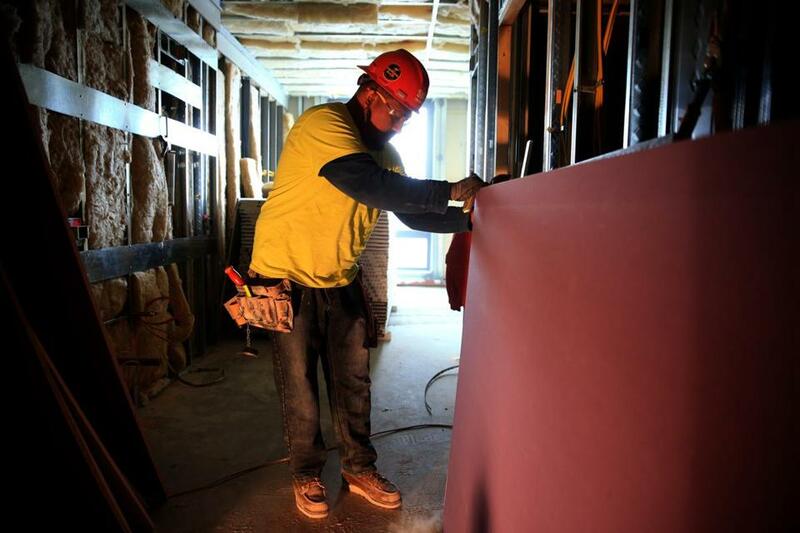 Omar Pedroza installed drywall at an East Boston apartment project. As a job foreman, he said he sometimes had to stuff cash from a subcontractor into his pockets to pay co-workers. Fernandes could not be located at his listed addresses and declined to comment through a spokeswoman. This summer, federal authorities reached a settlement with Force to pay $2.4 million in back wages and damages to 478 workers for “willful” violations. STACIE SOBOSIK, the Medford attorney who represents injured workers, said the most frustrating part of these cases is how general contractors persist, even after egregious workplace violations, in hiring abusive subcontractors. Force recently landed a job working on a new 447-unit development at Somerville’s Assembly Row. The contractor that hired the company is Callahan Construction Managers, a Bridgewater company that has managed several of the largest residential projects in the Boston area in recent years. Callahan, unlike Boston’s downtown commercial developers, often hires nonunion labor. The firm has been criticized by public officials in Quincy and Cambridge for allegedly failing to thoroughly vet its subcontractors. The company’s president, Pat Callahan, said in a statement that when he hired Force, he was unaware of its issues with the Labor Department and OSHA. General contractors bid on multimillion-dollar jobs and divvy up the work to a thicket of smaller firms. It has proven notoriously difficult for authorities to police those subcontractors, according to regulators in Massachusetts, New Hampshire, and Connecticut. JUAN GONZALEZ, a 36-year-old from Mexico, worked for Yankee Drywall Corp. in Hudson, N.H., for nearly 15 years. His father, nephew, and cousin worked there too. He put up with the company’s difficult owners, he said, because the money was good. He started at $26 per hour and worked his way up to $33, and made enough to send some home to his mother. The company is owned by Gerald “Gerry” Crete, a gruff 59-year-old who runs the business with his wife, Martha Laramee, out of their home. They have a tidy yard and $50,000, his-and-hers, four-door Ford pickup trucks, black and white, in the driveway. There would be weeks the workers were paid, followed by missed weeks, then promises of catching up. By late last year, Yankee allegedly owed more than $150,000 to a dozen workers, including Gonzalez and his family members. “They used to tell us, ‘If you leave, I’m not going to give you the money. So you’ve got to show up for work tomorrow,’ ” said Iran Gonzalez, Juan’s cousin. In late December, Juan Gonzalez received an angry voicemail from Crete, peppered with expletives, pleading with him and the other workers to return, and promising they would be paid. But the Gonzalez family had had enough: This time, they took their complaints to the authorities. “You have to be a tough guy in this business,’’ Crete said during an interview in the couple’s kitchen in March. He called the industry “crooked,” and bitterly blamed missed payments to his crew on contractors who, he said, owed him money. He said he owed the men no more than $5,000 each in back pay. But Juan Gonzalez said he alone is owed more than $20,000. “I’m broke,’’ Crete said. He claimed to have filed for bankruptcy protection, but there were no such records in federal court in New Hampshire. In April, Attorney General Healey’s office investigated and cited the company and Crete $26,000 for intentionally failing to pay employees and misclassifying them as independent contractors to avoid paying benefits and workers’ compensation. Crete failed to respond to the AG’s demand for records, according to Healey spokeswoman Jillian Fennimore, and allegedly ignored multiple attempts to resolve the allegations. New Hampshire’s labor department is pursuing Yankee for $171,000 in unpaid wages plus penalties. A hearing is set on the matter for October. 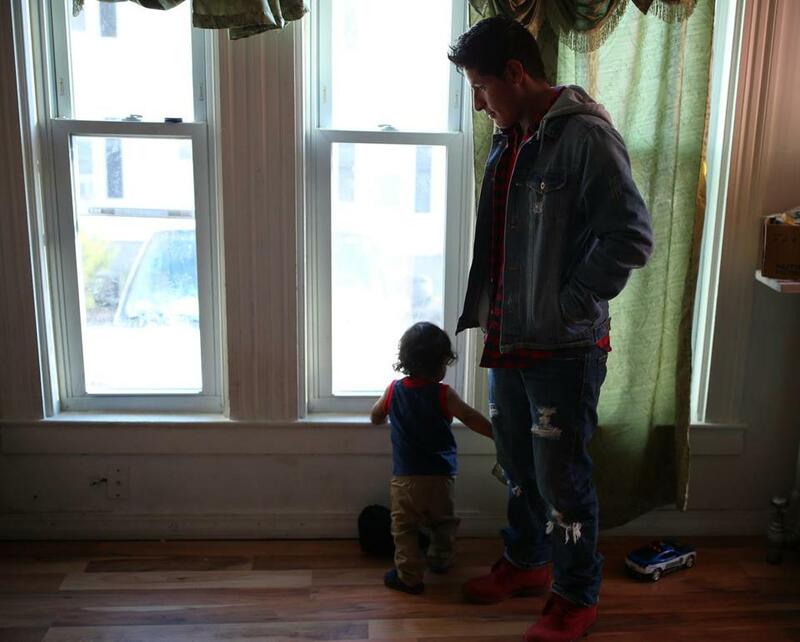 Mayancela and his little brother Filemon, 14 months, spent time together at Mayancela’s Brockton home. EVEN WHEN AUTHORITIES do catch firms breaking the law, it can be cheaper for employers to pay fines than follow the rules. Some firms simply skip town and open under a new name. Of the 1,300 complaints to the Massachusetts attorney general over the past three years, the office issued 455 citations against construction employers, sometimes multiple times, seeking restitution totaling $2.4 million and nearly $1 million in penalties, according to public records requests. But companies often fail to pay even small sums. Healey’s office has collected just one-third of the $1.7 million in violations since January 2015, or $580,234. The bulk of the rest is under appeal or past due. The AG’s office can’t readily say how much it collected prior to 2015, because the records were not computerized. In Massachusetts, workers have to navigate a number of agencies to complain about employers who break the law. Neither the attorney general nor OSHA can easily shut down a company, even if it has multiple violations against it. The state Department of Industrial Accidents can issue stop-work orders when its investigators find companies not paying for workers’ compensation. Governor Charlie Baker and Deval Patrick before him have heard the complaints of union executives that firms paying in the low $20s per hour or less, without overtime or insurance, are unfair competition. The residential union construction rate in Boston, including insurance and benefits, is $45 per hour, according to the New England Regional Council of Carpenters. THE RECENTLY COMPLETED One North of Boston complex in Chelsea, a $110 million project with some 450 apartments, boasts luxury studios for $1,735 a month and two-bedrooms for $2,390. There are yoga and spin studios, an indoor basketball court, and doggie day care. The general contractor was Callahan, the Bridgewater company. On one visit by the Globe, Universal Drywall of Auburn, N.H., had about 30 workers framing and building walls at the massive property; only a handful were marked as employees on sign-in sheets. The rest were classified as subcontractors — the same practice the attorney general challenged when it sued Universal in 2014, alleging a “pattern of unfair competition” on the Chelsea job because it did not pay workers as employees. That case is ongoing, according to the AG’s office. Omar Pedroza, an ex-foreman on the site, was asked to illegally distribute cash wages to the workers, he told the Globe and his legal advocates. He sometimes had to drive long distances to pick up money from a Universal subcontractor he was working for, stuffing some $5,000 in cash into his pockets to distribute to workers. A lawyer for Universal, Simon C. Leeming, said in a statement, “Universal has never paid an employee in cash, never.” If employees received cash, he said, it was done by a subcontractor. He said the company’s subcontractors are required to comply with the law. After the alleged issues in Chelsea, Callahan decided not to use Universal as a subcontractor on its Marina Bay residential project now underway in Quincy, spokeswoman Lisa Nickerson said. Universal is still working for Callahan on other jobs. LAST FALL, CONSTRUCTION workers and organizers chanted Callahan’s name in downtown Wellesley, outside luxury condos called the Belclare, on behalf of a worker who wasn’t being paid. Callahan representatives said the company has been unfairly targeted by union advocates, and that it had taken over the Belclare job from another firm, and so was not responsible for hiring the subcontractors. One of those subs was William Ashmore, a former owner of Stoddard’s pub in downtown Boston. A group of workers went looking for Ashmore on Cape Cod to get paid, to no avail. Three sued him in small claims court, alleging he owed them thousands of dollars. But he failed to show up in court, even after promising at a New Bedford worker center meeting to pay the men. Finally, the court issued a warrant for his arrest. “I had every plan to deal with it,’’ Ashmore said. Some instances were misunderstandings, he said, or a failure by workers to provide accurate addresses. Once, he said, another firm should have paid the workers. Beth Healy can be reached at beth.healy@globe.com. Follow her on Twitter @HealyBeth. Megan Woolhouse can be reached at megan.woolhouse@globe.com. Follow her on Twitter @MegWoolhouse.